On one level, The Incredible Hulk was a horrific Franken-show. Its cast and crew of soap opera veterans had little idea how to run a superhero series. 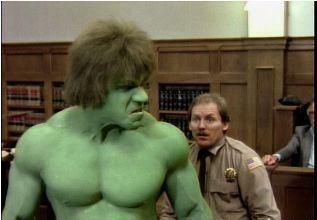 Its producers could barely drum up enough money to keep the green paint on Lou Ferrigno’s skin. And the network insisted on changing the main character’s name from “Bruce” to “David” because “Bruce” was just sooo gay. Even in 1979. And yet it ran for five years with respectable ratings. The fan base seemed to grow and grow. People just couldn’t get enough of the not-so-jolly green giant and his puny human alter-ego. This marked a spike of hope in that superhero dead zone. Not bad considering every show featured exactly the same plot.